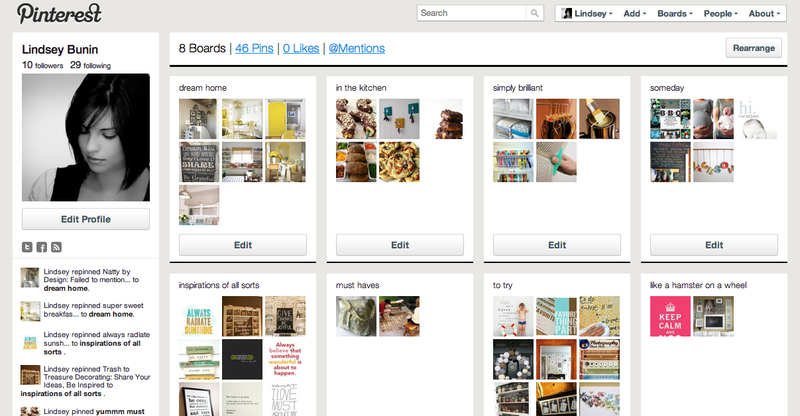 Not sure if you’ve heard of this little thing called Pinterest? I’ll admit, I was skeptical at first. Another site to subscribe to and keep up with just didn’t seem worth it, regardless of how many bloggers/tweeters/FBers swore it was the best. thing. ever. But then I gave in, thinking I’d just unsubscribe if I didn’t like it. Ha. I dare you not to love it. It’s essentially an online inspiration board builder. Instead of bookmarking or saving photos to your computer when you want to stash an idea for later, you simply pin it to one of your boards. Then the beauty is that it’s kind of like Twitter in that you can follow other people and see what they’re pinning, too. I follow like-minded gals, so for me Pinterest is full of diy ideas and inspiring quotes and drool-worthy decor and must-try recipes. I used to have photos saved and ideas bookmarked all over the place, with no real system. Now, I’ve got my inspirations in neat and tidy categories. Love. If you’re way ahead of me and are already Pinterest obsessed, feel free to follow me here. I now feel like I'm the only one WITHOUT a Pinterest, lol.